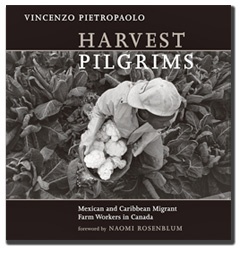 Canadian photographer and social activist Vincenzo Pietropaolo recently displayed his award winning collection of migrant farm worker images, entitled “Harvest Pilgrims”, along with other works, at a prestigious exhibit at the University of Rome. The exhibit took place in Rome, Italy from April 23 to May 7. It was part of a larger symposium where participants debated the new and old intercultural and social dimensions of immigration and migration. Pietropaolo has been documenting the plight of migrant farm workers in Canada since 1984. A collection of those images was recently published in a new photo essay book titled Harvest Pilgrims - Mexican and Caribbean Migrant Farm Workers in Canada. Harvest Pilgrims was published with the support of UFCW Canada and released in December.